If you have been feeling pushed, prodded and put out to dry, then you are not alone. The Universe energy has been redefining us and helping us face up to the gritty aspects of our lives and personality to make room for better things since early this year. You need to get rid of the clutter before you redecorate it. This is how energy works, you have to let go of certain things to make room for positive energy. It is easy to wreck a room but hours to clean it up! This is what the Universe has been doing for us. The autumnal equinox the first day of autumn was on Sunday (Sept 23rd). This is when the equator passes the centre of the sun and gives the same amount of daylight in both the south and north poles. The days get shorter and the nights longer. Equinox in Latin means equal light. This is the time we start appreciating the light, knowing that the coming months will be grey and cold. We can draw lessons from nature’s life cycle and keep a hold of the light in our lives. Honour the light within you. Give thanks to what you have to build on the abundance. The more you pay attention to and acknowledge the light within you, it will encourage more positivity in your life. If you keep feeling negative then remember that you will be manifesting more of the same. So be aware what you are focusing on and manifesting. It will be a cycle that will be hard to beat as it will be your default setting. Don’t be surprised if you have been feeling like you need space from people and from situations. There is a need to keep our energy and space clean from others. You will want to keep to yourself and remove yourself from difficult situations. Relationships may suffer or improve depending on where you are in your individual journeys. Some of us will want space between us and our loved ones which may cause the other party distress. You have nothing to worry about long as your communication channels are open. Explain how you feel and why you feel a certain way and ensure they are aware it’s nothing to do with them. There is a reason for this. We are levelling up and our soul is trying to reconnect with Life Purpose- the reason why we have come to Earth. We all have a different reason for this life. Michael Jackson was here to create timeless music, inspire generations of musicians after him and maybe even make us more sympathetic to people with skin conditions. I can see this with Winnie Harlow who suffers from vitiligo. While Michael was ridiculed and suffered mentally from this condition, Winnie is celebrated for her appearance. It is beautiful to see her on front covers of magazines as a top model. Your reason for being here could be anything from being a lesson to someone in your life to writing a book to inspire school children. Until you are aware of this, there will be a pattern of resistance that will occur again and again until you acknowledge it. There is also a fire element to this Full Moon. So you will be pushed towards finishing what you started. I wouldn’t be surprised if some of you have been surprised by how fast things moved for you at the beginning of the month. 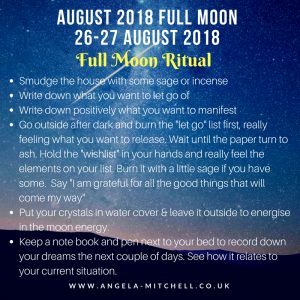 We have a very productive window until the October 9th new moon. As Aries can be a little fiery so remember your energy can be a little over whelming for others and you need to take a deep breath before reacting. I have mentioned relationships being tested so just beware that you need to balance your emotions this month. You will be passionate about certain subjects and I feel there will be plenty to discuss in terms of a shakeup in global politics. So just keep a level head and be kind. This Full Moon will test your emotions but push you to keep going towards your goals. 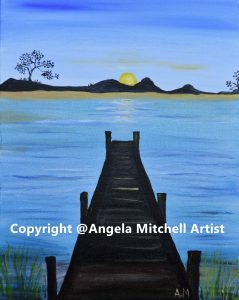 It will also remind you to keep an open mind to be able to make way for positive outcomes. You will also be encouraged to make time and space for yourself. You will feel emotional and there will be some crying. Old wounds such as grief and traumas will resurface for you to reflect on. Crying is incredibly healing and sometimes we need it to wash away some of the build up stress and sadness that we store in our hearts and minds. Physical symptoms right now that people may experience are heady feeling, almost like a cold and tummy issues. This is because the energy is hitting us hardest in our solar plexus and Crown Chakras. If you feel overwhelmed then sage yourself from top to bottom, starting from the top of your head down to your 3rd eyes, heart, solar plexus down to your root chakra and let the energy flow down to your feet. I have been loving this beautiful calming music to mediate to this week. 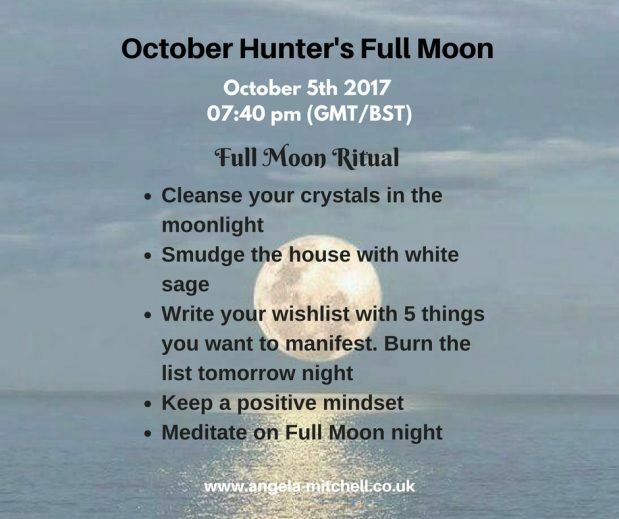 Tonight is a great time to do your Full Moon Ritual. Below is a summary of what to do but for full instructions please read my Moon Ritual the most comprehensive guide to doing your moon rituals. The shifts of these last couple of months in 2018 has been intense and for some, life changing. 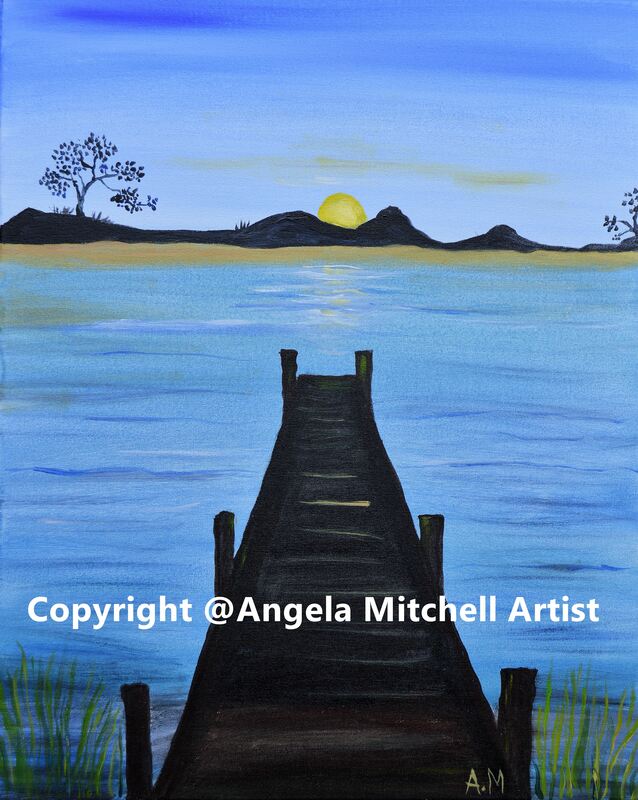 There has been a number of new beginnings that has pushed us out of our comfort zones. This has been from a shift in our own ability to grasp reality, confidence to how we view the world. The obvious ones are career, relationship and where we live. Do not underestimate shifts to go with our emotions and thinking because they spark off massive transformations in all areas of our lives. 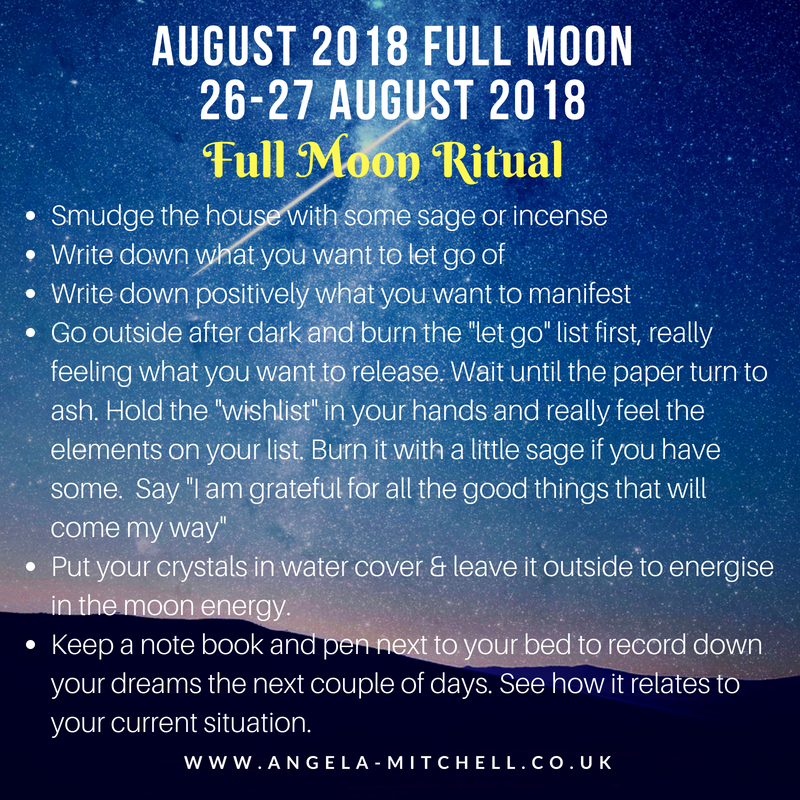 As we head into May’s Full Moon which falls on May 29th, which is in Sagittarius, we will have a huge urge to “break free” from traditions, restrictions and look to re-energise our relationship sector. This shift will help those who are caught up in cycles – of addiction, love-hate relationships to playing the victim. Healing old family wounds or things that have shaped your relationship attraction will influence how you perceive your partner or even who you attract. If you are in a self sabotage cycle then you will always be pushing your partner away because it never feels right. This is a sabotage syndrome but also one of defence. The moment someone gets too close then you want to protect yourself. 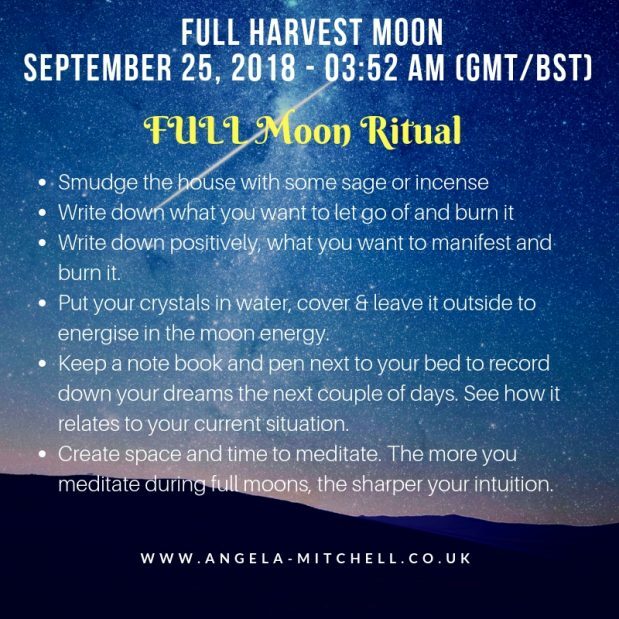 Use this shift in energy and with the Sagittarius influence on the moon to see through all this and find your freedom within. Relationship matters will be the core discussion until June 15th. Don’t sweep it under the carpet, try to get to the bottom of the issue, why you feel a certain way or why someone is behaving in a way that upsets you. Don’t be surprised if old flames or friends you are no longer speaking to, come stumbling into your life at this time. Lessons need to be learned and closure required to end the cycle. If you always feel like a “victim” then understand where you stand in the story and who is the aggressor. Does it feel “safe” to be the victim? Do you need to change things so you have a different story line where you are neither? If are always “rescuing” someone in your life from people, situations or emotions, which feel draining then change this. Give yourself the freedom to walk away. 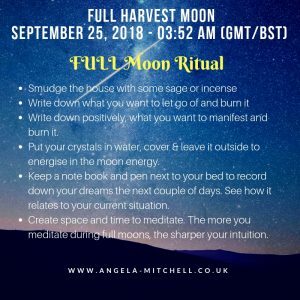 Use this full moon to ask questions because they will come to you. Many of us will start to feel more grounded and wanting to get in touch with our true feelings. You will also want to change your habits to include more fun and time for yourself. Our dreams this week will be deep, vivid and some will be prophetic. Spirit will be able to step into our dreams so watch out for messages, symbols and ideas. Write down your dreams this week – this is important! This is best done any time between now and the 30th. Allocate about 20-30mins or an hour if you wish. Find a comfortable space where you won’t be disturbed and listen to this beautiful and uplifting Gaytri Mantra on your earphones. Close your eyes, breath regularly and slowly.Try to sing along as that will distract your mind and allow your soul to speak. Keep paper and pen next to you. Write down anything that drifts into your mind. Allow yourself to let go and just follow the mantra and music. You will be very tingly and calm afterwards. Do this before you go to bed and you will sleep really well.